Died at Glen Aire retirement community in Cary. She was cremated, and ashes were not buried until a family memorial service in the Spring. 6) Haywood, Houston, son, age 1, born NC, parents born NC. 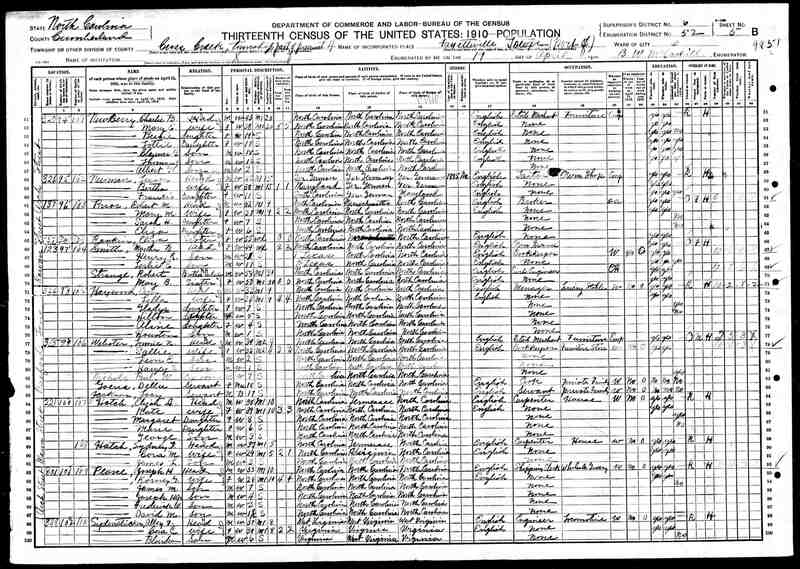 8) Haywood, Ethel, daughter, age 6, not attending school, born NC, parents born NC. 5. Appearance in Document: Newspaper ariticle, 13 Sep 1928, Burlington, Alamance County, North Carolina, United States. 4159 "Glenhope School Opens Monday"
15. Appearance in Document, 1950, Bonlee, Chatham County, North Carolina, United States. 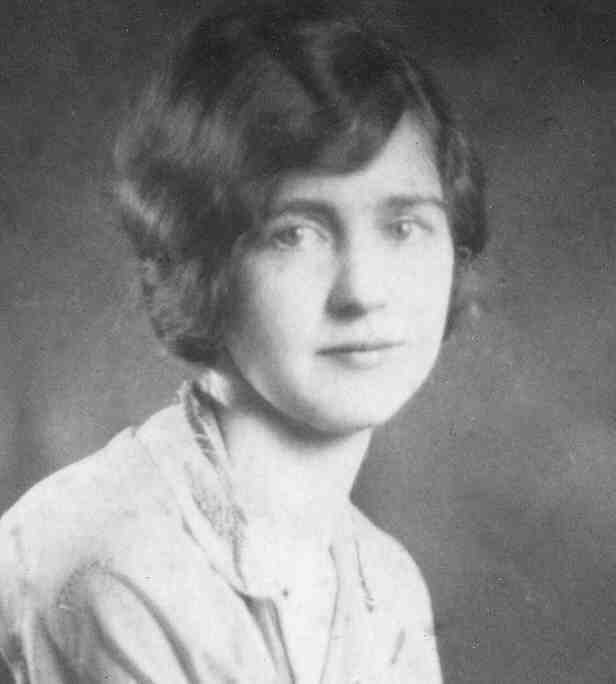 Mrs C. C. Lindley is pictured in the 1950 Bonlee High School yearbook. 16. Residence, 1950, "Woodlin", Chatham County, North Carolina, United States. 18. Residence, 5 Mar 1955, "Woodlin", Chatham County, North Carolina, United States. 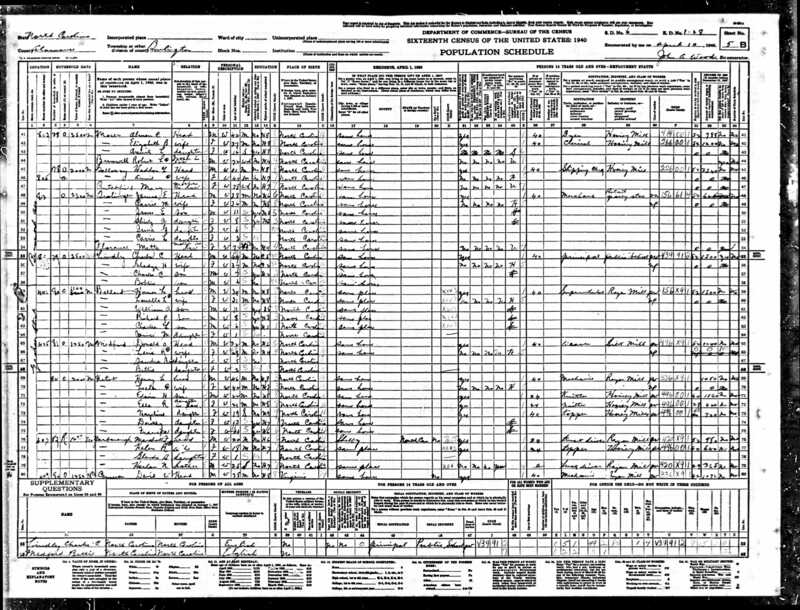 929 Mrs. Gladys Lindley is resident of Chapel Hill, NC, at time of father's death on 5 March 1955. 19. Story: Quoted in Herb Article, 3 Jun 1978, Chapel Hill, Orange County, North Carolina, United States. 4168 Gladys was quoted in a newspaper article about care for herbs. She was speaking as one of the volunteers at the N. C. Botanical Gardens at the University of North Carolina. A soil mixture for cuttings should consist of one-third part purlite, one-third part peat moss and one-third part sand. Cuttings may also be rooted in sand alone, said Mrs. Gladys Lindley. "Always handle herbs by their leaves when transplanting or cutting them," Mrs. Lindley said. "Their limbs and stems are very tender. If a leaf is bruised, it won't hurt the plant, but bruised stems could cause poor luck in transplanting." For persons ambitious enough to start herbs from seeds, Mrs. Lindley recomends the use of a mixture of one-half peat moss and one-half sand with a little purlite. "Don't cover the seeds deeply," Mrs. Lindley said. "One-eighth of an inch of soil is fine for small seeds." 20. Residence, Sep 1993, Cary, Wake County, North Carolina, United States. Gladys moved from Woodlin to Glenaire retirement community in Cary in Sept 1993. She soon became well known there for her orchids and her wildflower path through the woods near her apartment. In May 1998 she went to the hospital for surgery, but soon recovered and returned to her apartment at Glenaire. In early 2000, she moved from her apartment to a new apartment in the assisted living area of Glenaire. 21. Medical, 3 May 1998. Gladys had hernia surgery at Wake Medical Center in Raleigh. 22. Obituary, 1 Jan 2004, Chatham County, North Carolina Colony. 4150 Gladys Haywood Lindley, 101, died Wednesday (12-24-03) at Glenaire Retirement Community, Cary, N.C. Mrs. Lindley was a native of Cumberland County. She was a retired teacher, having taught for many years in Bonlee and Pittsboro schools. She was a member of University Presbyterian Church in Chapel Hill. After her retirement from teaching, she was active in the Chapel Hill Garden Club, the Herb Volunteers of the North Carolina Botanical Garden, and Lystra Homemakers Club. She was preceeded in death by her husband, C. C. Lindley, and son, Charles Clinton Lindley, Jr. She is survived by her son, Robert Lindley; his wife, Shirley; three grandchildren and five great grandchildren. A family service will be held at Moore's Chapel Cemetery in Saxapahaw at a later date. Memorials may be made to Glenaire Foundation, 4000 Glenaire Circle, Cary, N.C. 27511. 24. Religion: Baptist, then Presbyterian. 28. Story. I have Downing family photo showing Gladys, and many slide copies of photos showing Gladys at various ages. Some also show some of her siblings. 30. 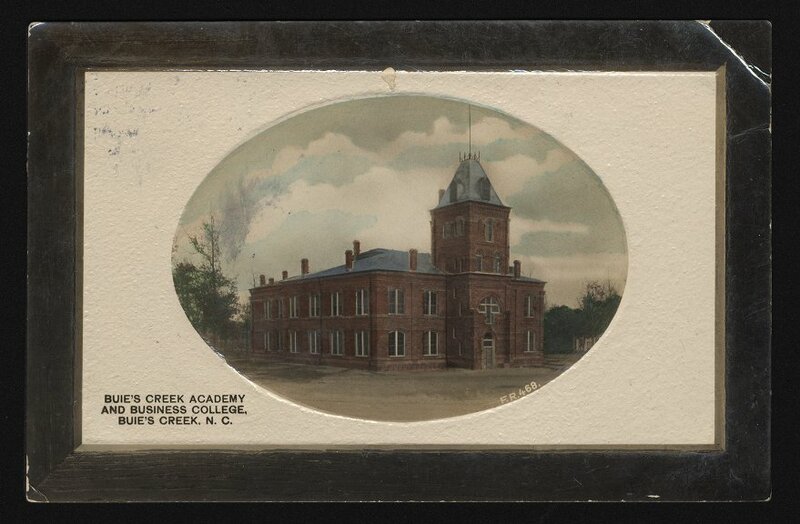 Story: Buies Creek Academy: Buie's Creek, Harnett County, North Carolina, United States. Campbell University was founded as Buies Creek Academy on January 5, 1887, by James Archibald Campbell, a North Carolina preacher who believed that no student should be denied admission because of lack of funds. In 1926, the school attained junior college status and changed its name from Buies Creek Academy to Campbell Junior College. In 1961, Campbell became a senior college. The name was changed to Campbell University on June 6, 1979. 31. Story: Gladys's Path, 30 Jul 1994, Cary, Wake County, North Carolina, United States. 4164 On this date, the Glenaire Residents Association dedicated Gladys's Path. The path went through the woods behind her apartment to the "Wee Loch" pond on the grounds. Gladys and other residents and family had cleared the path, identified and labeled many of the trees and shrubs, and transplanted many wild flowers from her former home in Chapel Hill. After her death, the path began to get overgrown. In the Spring 2013 the path was renovated with new mulch, benches, and steps. There was a rededication ceremony on 1 August 2013 which was attended by her son Bob and his wife Shirley. 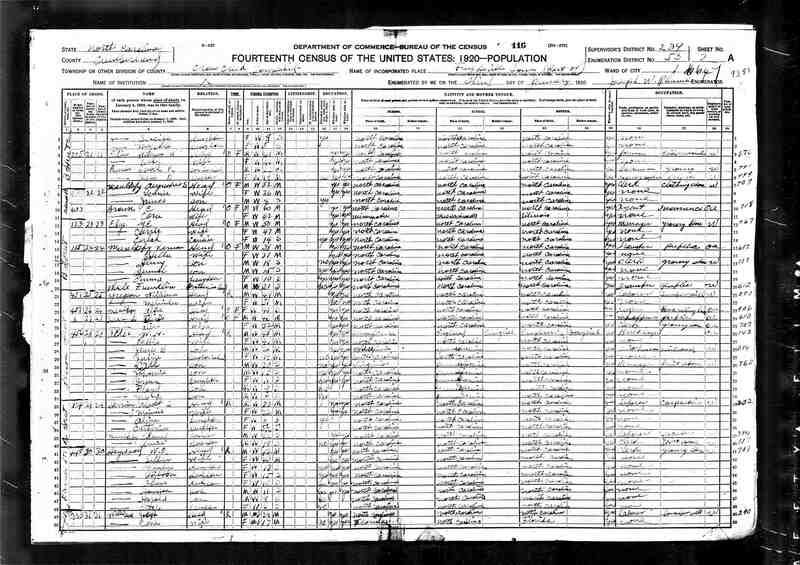 Virginia married Charles Clinton* LINDLEY, son of William Foushee* LINDLEY and Lucinda Jeanette* TEAGUE, on 30 Aug 1927 in Fayetteville, Cumberland County, North Carolina, United States 1119,1919.,3920 (Charles Clinton* LINDLEY was born on 29 Sep 1890 in Alamance County, North Carolina, United States,1115,1119,1876,1919,3914,3921,3922,4146,4147 died on 19 Aug 1973 in Chapel Hill, Orange County, North Carolina, United States 3921,4146 and was buried in 1973 in Moore's Chapel Cemetery, Alamance County, North Carolina, United States 3921,4146,4148.). The cause of his death was Cardiac Arrest. 1. Marriage, 30 Aug 1927, Fayetteville, Cumberland County, North Carolina, United States. 3920 Marriage License dated Aug 29 1927 in Cumberland County, NC. Charles Clinton Lindley of Burlington NC, age 36, son of William Lindley (living) and Jenette Lindley (deceased) of Saxapahaw NC, and Virginia Gladys Haywood of Fayetteville NC, age 25, daughter of Oscar Haywood and Lella Haywood, both lliving, of Fayetteville. Marriage performed 30 Aug 1927 in Fayetteville. WItnessed by Aline Haywood, Marion Downing, and W. O. Haywood, all of Fayetteville. 2. Marriage, 30 Aug 1927, Fayetteville, Cumberland County, North Carolina, United States. 1119 Chas Clinton Lindley of Burlington, age 36, married Virginia Gladys Haywood of Fayetteville, age 25. Person performing marriage: Isaac N. Kimbough, Minister of Gospel. Witnesses: Aline Haywood, Marion Downing, W. O. Haywood. 3. Marriage, 30 Aug 1927, Fayetteville, Cumberland County, North Carolina, United States. 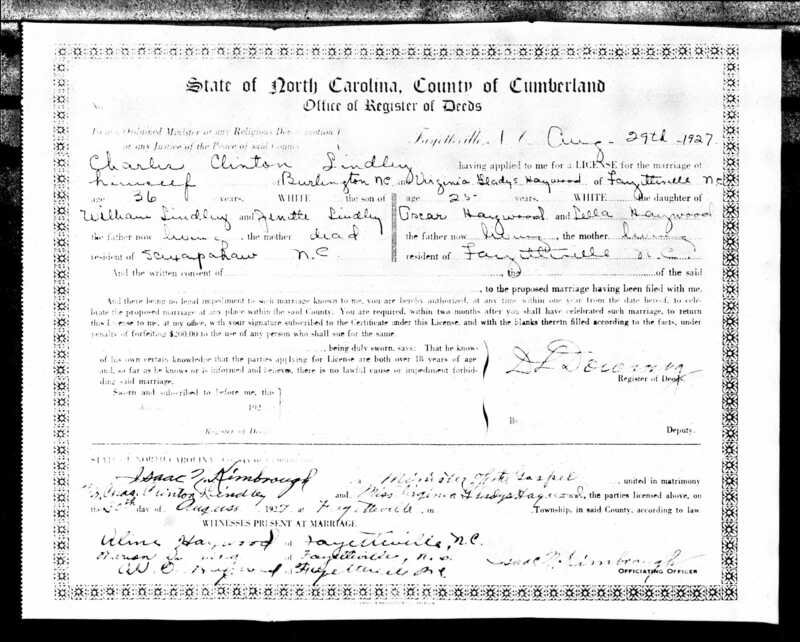 3919 Charles Clinton Lindley (born 1891, son of William and Jenette Lindley) married Virginia Gladys Haywood (born 1902, daughter of Oscar and Lella Haywood) on 30 Aug 1927 in Fayetteville, Cumberland Co, NC. 4. Story, 30 Aug 1927, Fayetteville, Cumberland County, North Carolina, United States. 816 Charles was engaged to a woman, but called it off after he met Gladys. He used his Elon class ring as a signet ring to seal early letters to Gladys. They were married at sunrise at Lella Downing Haywood's house on 30 Aug 1927. 5. Story. 3928 Charles had been engaged to a local girl prevously and the family already knew the other girl, so Gladys was not accepted right away. Margaret Lindley (wife of William Arthur Lindley) had also been excluded somewhat when she joined the family, so she made Gladys welcome.